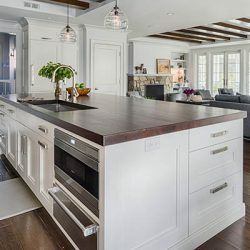 The kitchen is typically the center of your home when entertaining guests, so shortcomings in the design may have become apparent this past holiday season. One of Renae’s talents is designing a kitchen customized to her clients’ needs. Major renovations will take several months, so make sure your renovating plans take that into consideration when planning. Also, consider your space and your budget. Renovations can run the gamut from a complete gut renovation and removal of walls to simple cosmetic upgrades. 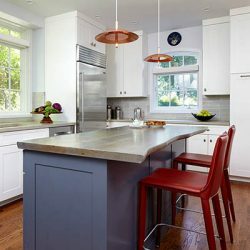 Let’s take a look at six elements of kitchen renovations: cabinetry, appliances, countertops, sink and faucets, backsplashes, and hardware. There’s no such thing as too much storage! 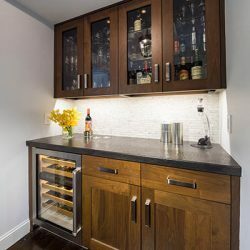 Add more storage options to your cabinets with some innovative approaches. Pull-out cabinets help you utilize every spare inch and can be integrated in surprising ways. Narrow spaces and corners can be an ideal place to integrate narrow pull-outs for spices or cooking oils. A dish drawer with movable pegs, like this one we designed for a client, can be reconfigured to store a variety of different sized dishware. If you have enough room, you may want to consider converting an underutilized space into a butler’s pantry. 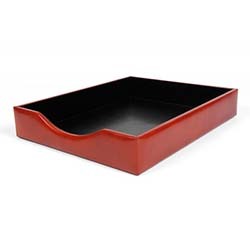 This is a useful amenity for serving food or drinks. Don’t be afraid to mix materials: white painted cabinets, wood finishes and a colored kitchen island is a great look! One of the most popular upgrades when undertaking kitchen renovations are the appliances. Of course, you will need a refrigerator, double wall ovens and a cooktop. There are many options that you may not have considered. 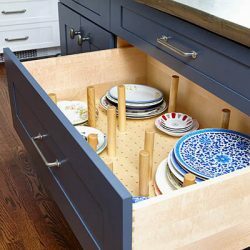 Consider adding a dishwasher drawer for small loads. You may find this particularly useful when entertaining and you find you are running short on clean glassware or dishes. Another smaller appliance that is useful when entertaining is a warming drawer that holds your food at the correct temperature until you are ready to serve it. It can also be used to warm plates. There is an amazing array of built-in appliances available, such as a coffee-maker. Consider upgrading your standard microwave to one that is also a convection oven. If you love microgreens, consider adding an in-kitchen microgreen grow station. 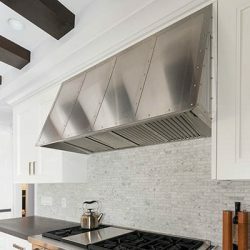 We designed this custom range hood for one of our clients. Countertops are also a popular choice when upgrading a kitchen and you can choose from many options. Natural stones, such as marble are a beautiful option that fit with both modern and traditional kitchens. Likewise, quartz composite counters are versatile and beautiful. 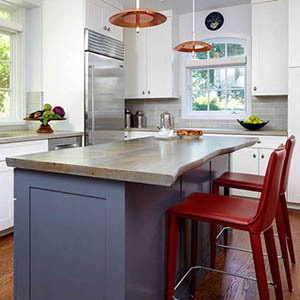 Concrete is a great material for your kitchen and it can be integrated for a seamless countertop and sink. 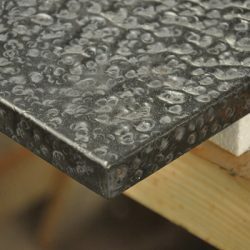 We have also had great success with zinc, granite and walnut countertops. 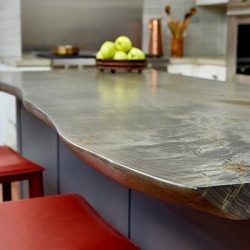 We love this hammered pewter countertop. New technology forthcoming from ConvenientPower Systems and Formica will soon allow you to make your countertop into a charging station! 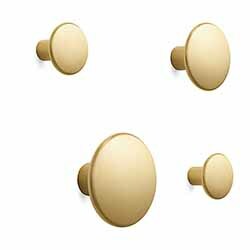 As we have discussed in past months, brass is on-trend again and there are many great options available for cabinet hardware. Another trend we are noticing is hardware with a black finish. 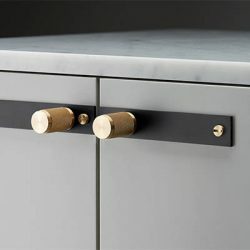 These furniture knobs are available from Buster + Punch and Rocky Mountain Hardware. 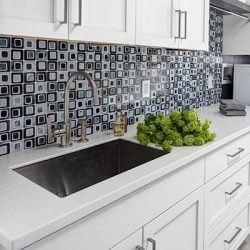 According to a survey by Houzz, white backsplashes were the most popular option for kitchen renovations last year. This makes sense, as there are so many beautiful options in stone, ceramic and porcelain tile. If you wish to go a little bolder, there are many graphic options. Make it your New Year’s resolution to make your home more orderly! Set a goal of organizing one room or section of your home monthly and by the holidays, your entire home will be more attractive and ready for guests when the holidays roll around again. Renae is known for her high level of organization, so she is always on the lookout for beautiful and functional items for the home. 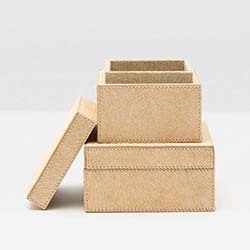 Replace storage items that are outdated or not functional with some of these great finds from Renae. Keep disorder at bay by keeping it out of your home! Sort mail as soon as you get it, recycling what isn’t needed and filing what you need to keep, rather than allowing it to pile up. A well-designed entry helps to keep necessities out of the way. It should feature hooks for wet scarves and jackets, an area for boots and cubbies for storing items that are used less often. 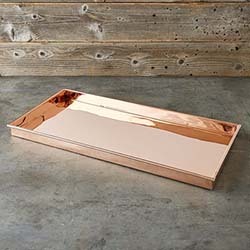 The metal coatrack hooks from Design Within Reach make a fun statement in your entry, and the copper boot tray from Williams-Sonoma will keep your floors free of melted snow. Next, get your kitchen organized! Updated cabinetry can help you better arrange your pantry, even if you have a small space. There are many beautiful storage options to keep your counters neat and clean. 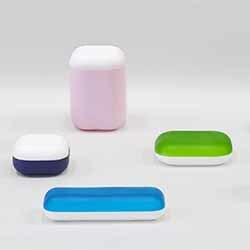 Consider these canisters and trays from Tina Frey Designs or this fruit bowl from Les Ateliers Courbet. Disorder can easily take hold in your bathroom. Clearing out old toiletries that you no longer use can go a long way to prevent this from happening. 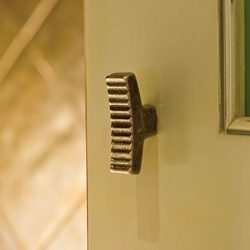 For the items that you wish to keep, there are many great accessories available for the bathroom. The tray is from Waterworks and the canister is from Pigeon and Poodle. Keeping the paper monster at bay can be a challenge, even if you have reduced the amount of mail by switching to electronic billing. 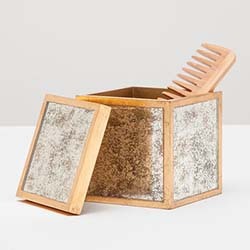 To help instill order your home office, we found these storage boxes from Pigeon & Poodle and this beautiful letter tray from Bosca. One of the best ways to declutter your closets is to eliminate items you no longer need. Once you have cleared some space, try out a new organizational system. You can go with a closet system like Elfa from the Container Store, but you may find that it isn’t necessary once your wardrobe is pared down. 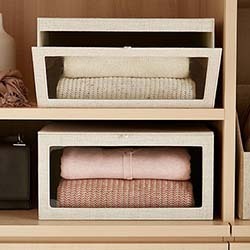 Instead, add a few new accessories, such as these sweater boxes from the Container Store for storing out-of-season items. We helped to create a wall of storage with California Closets for one of our Manhattan clients with limited closet space. Now is the time to get a jump on holiday hosting preparations! When hosting friends and family, it is important to be an organized and welcoming host. Advance planning allows you to relax and enjoy the company of your guests, rather than focusing on forgotten last-minute details. A fire burning in the fireplace is one of the nicest things about winter. Candles can also add a warm glow to your home. Use generously! 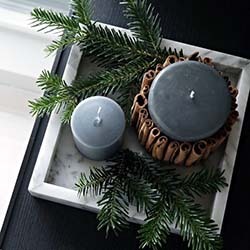 Place scented or unscented candles in a variety of containers all over the house for a beautiful effect. Having enough firewood at hand and the right fireplace accessories is important to facilitate the smooth procession of the evening. Wood can be stored in baskets on the hearth so that you are not interrupted by trips to the patio for more wood. Autumnal colors aren’t all browns. Don’t be afraid to add a pop of color to your home. Make a seasonal change in your décor without a complete overhaul by replacing your throw pillows with pillows in seasonal colors. This year’s trending colors include rich reds, such as Caliente from Benjamin Moore. You can incorporate rich shades of leather and wood into your décor, or bring in a new texture such as faux fur or sheepskin. 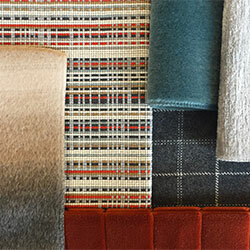 This palette of Pollack fabrics evokes a cozy seasonal aesthetic. This approach is not limited to pillows! Accessories of all types can be replaced seasonally. 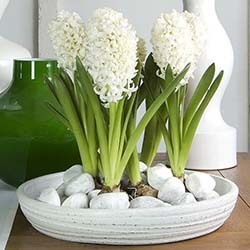 A beautiful handmade ceramic vase or dish is a one-of-a-kind accent that adds interest to your home. Your dining table presents another opportunity to create a seasonal color story for your home. This palette can be seasonal, yet not be overly holiday. 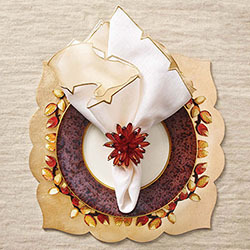 Incorporate new colors with napkins, table runners, dishes and floral arrangements. Cozying up your space for the holidays can be as easy as adding warm throws in convenient locations. 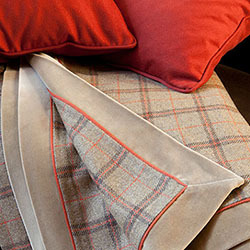 Adding an extra throw in your guest room is essential for colder winter nights. Don’t forget one for your own bedroom! 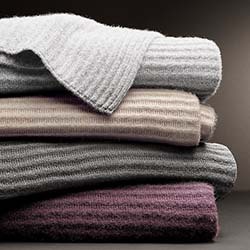 We find that we are always returning to cashmere and alpaca throws for their soft texture and incredible warmth. 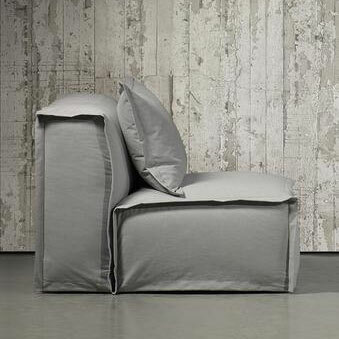 The throws above are available from Restoration Hardware and Loro Piana. Johanna Howard makes beautiful alpaca throws. There are also many great looking faux fur options on the market too! Hosting friends and family for the holidays means unpacking the fine china and crystal. 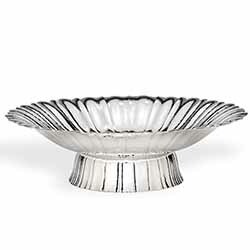 Now is also the time to consider adding some sparkle to your table. Gold accents are on-trend this season! 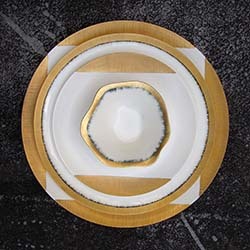 This beautiful porcelain tableware is hand made by Daniel Levy. 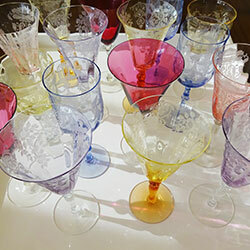 For a different twist on traditional crystal, set your table with colored glassware, such as these vintage American wine glasses. 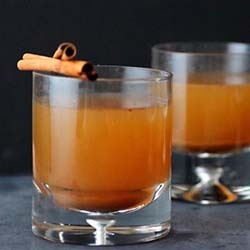 Warm beverages are a lovely way to celebrate the season! 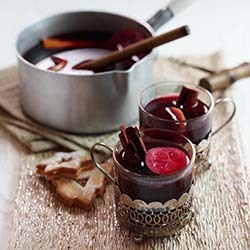 Greet your guests with warm cider, mulled wine or a hot toddy. They are not only delicious, but their aroma will drift through the house. It almost goes without saying that fresh baked cookies right out of the oven are one of the most welcoming scents to encounter! For those of us in the northeast, autumn and the onset of winter means fresh cut flowers from our own gardens are no longer an option. Fall foliage branches add an exquisite seasonal feel in the autumn months. In December, evergreen branches are handsome and the aroma is synonymous with the holidays. Magnolia and princess pine branches are beautiful on the mantle. 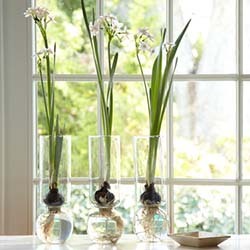 It requires some planning ahead, but forced bulbs are attractive and smell great! While the tendency is to only place floral arrangements in public spaces, a small arrangement in the guest room is a welcoming detail for your overnight guests. Last, but perhaps most important, think ahead for next year. Did you find that your table is too short to accommodate your family? 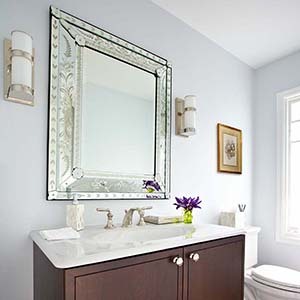 Does your guest bathroom need upgrades? Plan now to improve your home for the holidays next year so that your projects can be completed well in advance of the arrival of guests. 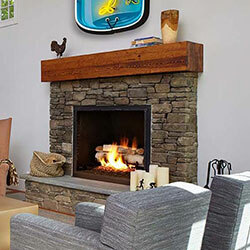 Early fall is a great time of year to see new design trends in New York. Two notable events that we recently attended were NY Now (aka “the gift show”) at the Javitz Center, and What’s New, What’s Next at the New York Design Center. Here are our trend takeaways for the upcoming season. 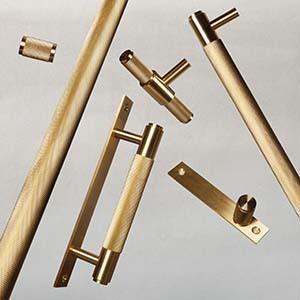 A change we have noticed lately is the shift from cool metallic finishes, such as brushed nickel, to warmer tones. Last year, we started seeing a good amount of copper, which was a huge contrast to the trends from the past few years. This year, we have seen more brass, particularly brushed brass. We have also noticed more mixing of different metals. Some of our favorites are cabinet hardware from Buster & Punch (above, right) and we love this tableware from Tina Frey (above, left). While Renae loves to use light and airy colors, we have been seeing bold, rich paint colors in many places. 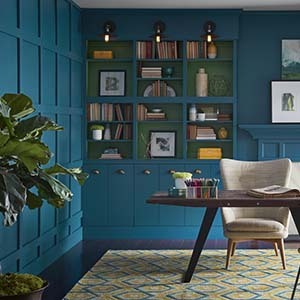 Sherwin-Williams paints just announced their color of the year for 2018: Oceanside (above, left). If you don’t wish to commit to such dark colors on your walls, you can still integrate them into your design in smaller ways. 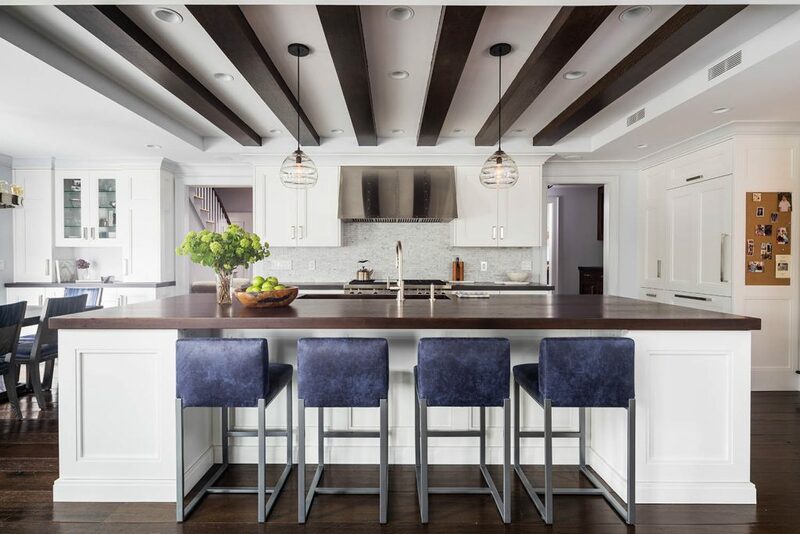 Renae designed the kitchen pictured above that features an island painted in Deep Space from Benjamin Moore. Another option is to integrate color with accessories. Blue Pheasant debuted a stunning line of tableware in matte navy blue at NY Now. It’s time to cozy up for fall, so blankets are on trend! We are seeing many lovely blankets and throws. A few textile designers have taken this to the next level and incorporated blanket patterns into other textiles and upholsteries. One of our favorite examples is the collaboration between Pendelton, a classic American blanket manufacturer, and Sunbrella, a leading manufacturer of weather-proof upholstery (above, left). 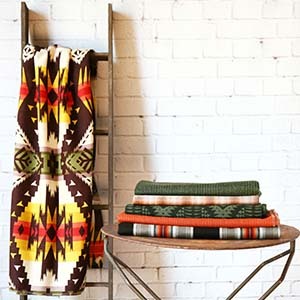 As for blankets, we always love to see what Johanna Howard has to offer. Baby alpacas are certainly the softest animal on the planet, and Johanna Howard has spun up some truly lovely new designs with their wool. 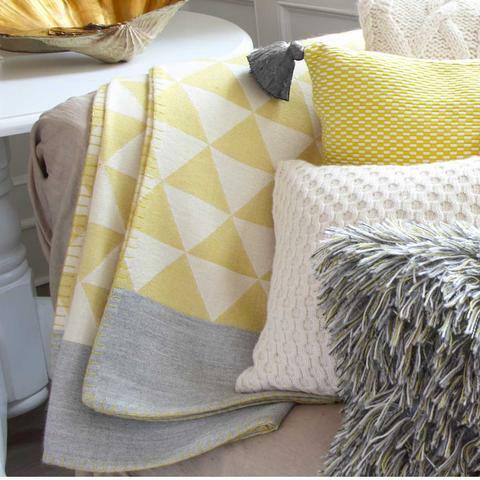 Renae has used Johanna’s Reversible Throw in several clients’ apartments, but we are also fans of her graphic patterns, such as the Stockholm Throw (above, right). Wallpaper has been making a comeback, and why not with so many fantastic options? Borrowing from traditional styles, many manufacturers are offering hand-printed and painted wallpapers. The amazing faux concrete wallpaper from NLXL (above, right) is incredibly realistic. 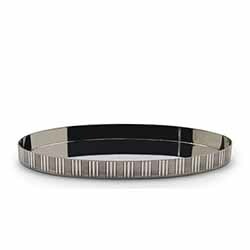 They also offer faux wood, faux pressed tin and an array of bold graphic patterns. There are many beautiful metallic wallcoverings on the market now, including options from Phillip Jeffries and Donghia. 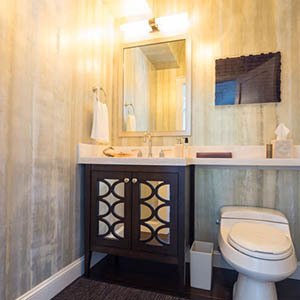 Renae chose to use the Mirage wallpaper from Robert Crowder in the powder room pictured above. Another interesting and unique option is block-printed wallpaper from Farrow & Ball, or even hand-painted wallpaper from Gracie. The traditional styles we are seeing in wallcoverings brings us to another trend we have noticed, and one that, considering Renae’s beginnings in the antique business, we are big fans of: mixing the old with the new. Sometimes it is better to opt for quality collectibles from a bygone era than something newer that may not have the staying power that a classic piece can offer. For example, there are many beautiful antique light fixtures available. Renae has incorporated vintage Murano glass chandeliers and Baccarat crystal lighting in many of her projects. Mixing these older items with more modern selections allows you to create a look that is uniquely yours! 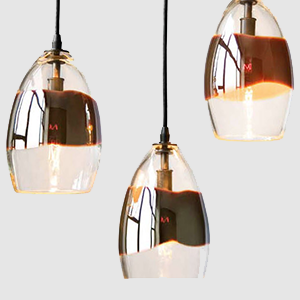 A trend that we have noticed in lighting is bespoke fixtures. 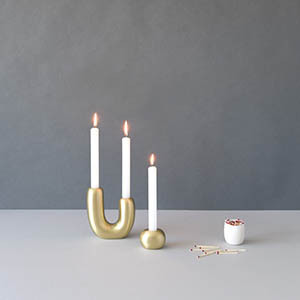 We have recently seen some beautiful designs from Apparatus Studio (above, left) and Alison Berger (above, right). 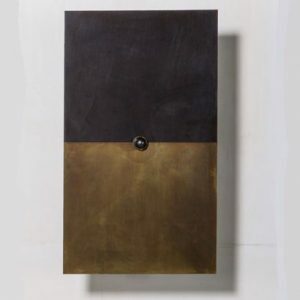 As with hardware, we have been seeing mixed metal finishes.